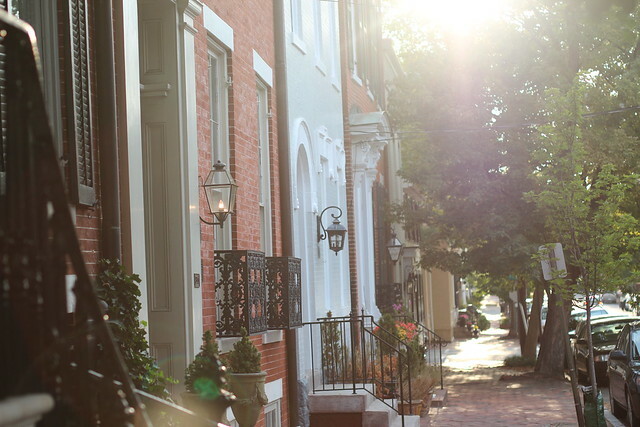 The homes around Old Town Alexandria, due to their age and unique architectural variations, represent one of the more interesting towns we've ever seen (though we may be biased). The city has grown organically over hundreds of years, slowly transforming itself from a tobacco port, to colonial shipping town, to a slave trading hub, to a Union occupied Civil War port, to a Victorian shipping seaport, to a component of the industrial revolution, and finally to the quaint and historic town we know today. As each transformation occurred and each major period in American history passed, so too did the architectural styles of the various estate homes, row houses, and city dwellings that line the streets of Old Town. To us, these eclectic homes with all of their period specific styling and unique designs are two of the primary aspects of Old Town Alexandria that helps make our town stand apart as a true gem of a place to live. 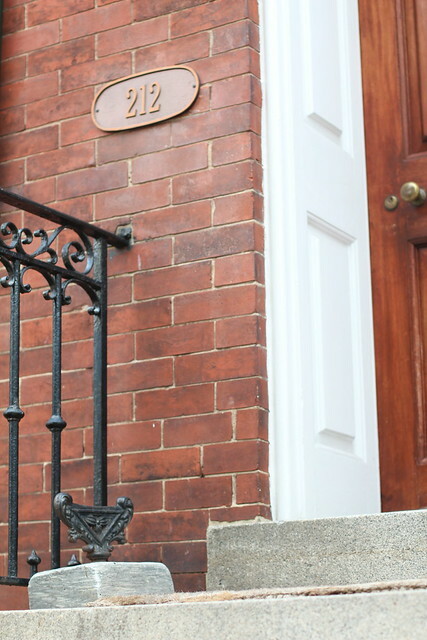 But it seems that, no matter the age of the many homes around Old Town, some architectural elements form a common thread that weaves throughout the changing styles and periods. Whether we're talking about ornate door knobs, original wavy glass double hung window sash, or transom windows, some details seem to persevere through the ages, though they may have changed a bit with the styles of the day. One aspect of these architectural elements throughout Old Town that still exists at the front door of dozens of homes is actually one of my personal favorite elements of some older properties, and it actually makes me rather sad that we don't have one in the front of our home. The item? 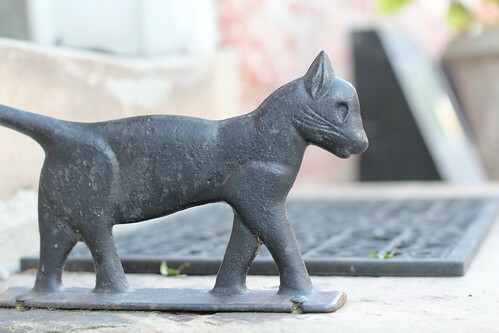 A classic antique boot scraper. 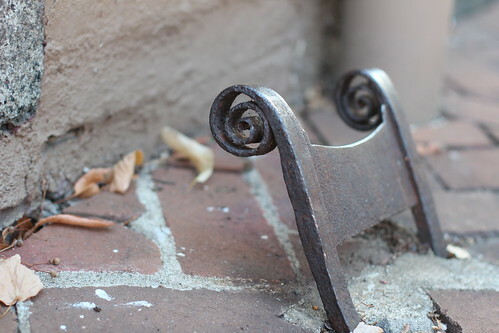 Boot scrapers, as their name suggests, are meant to scrape mud and other filth from the bottom of boots prior to entering a home, so as not to track whatever nastiness you may have had attached to the sole of your boots into the house through the front door. Though they originally gained popularity in European cities in the late 18th century when it became fashionable for the wealthy to stroll city thoroughfares, American cities full of muddy streets, horses (and their manure), and general gutter trash, made the need to scrape your boots prior to entering the home an absolute necessity all around town. It's fitting that their rise in popularity occurred in 18th century France, where the French word for these little implements of utilitarian convenience is "decrottoir," or literally translated to "excrement remover." 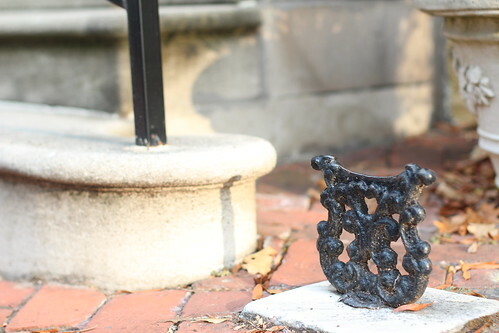 Most boot scrapers were typically installed just outside of the front entrance of homes, often driven into pieces of marble, granite, or other stone, and then fitted into the landscape of the sidewalk. They were responsible for hard duty and had to withstand repeatedly being stepped on and kicked at, all in the hopes of cleaning as much as possible form the bottoms of feet. As a result, the original scrapers often show significant signs of gradual wear. 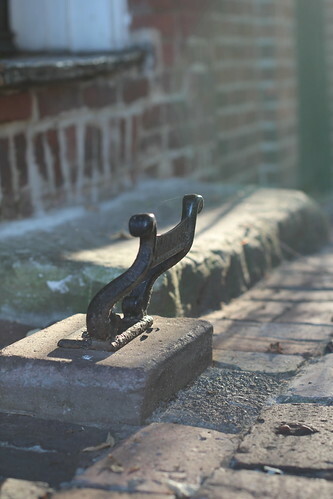 Sometimes the long legs of boot scrapers were driven between bricks in the sidewalk, their spikes acting like deep roots for the small bit of hardware that existed above ground. The heavy stone bases or deep rooted spikes offered something substantial and sturdy the users could really lean against when trying to remove the muck from the bottom of their feet. Today, many of these Old Town boot scrapers still exist in front of both modest and impressive homes, and each have their own character or unique design that help make them stand out while sometimes hiding at the same time. While wandering around Old Town and taking photos of the vast variety of styles and mounting locations, I noticed bit of a trend. 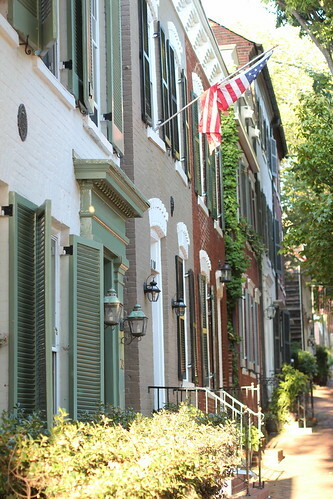 It seems the majority of the scrapers are installed on homes built in the late 18th century to the mid 19th century. There are some exceptions to this trend, but for the most part you can tell the rough age of the boot scraper from the material it was constructed with. 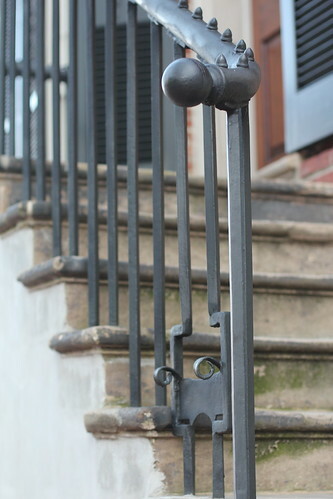 The oldest scrapers are often a bit larger and are hand made from wrought iron. While the "newer" scrapers (you know, from the mid 1800s) are often more ornate and made using cast iron, or a cast iron and steel hybrid. 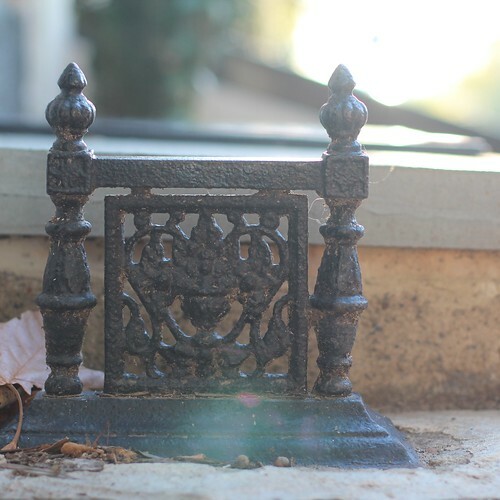 No matter the material, size, or location, the purpose is simple, place the scraper near the front door or front steps, allow the guest to scrape their boots, and therefore help protect your floors from gunk and grime tracked in from the streets. Problems solved. 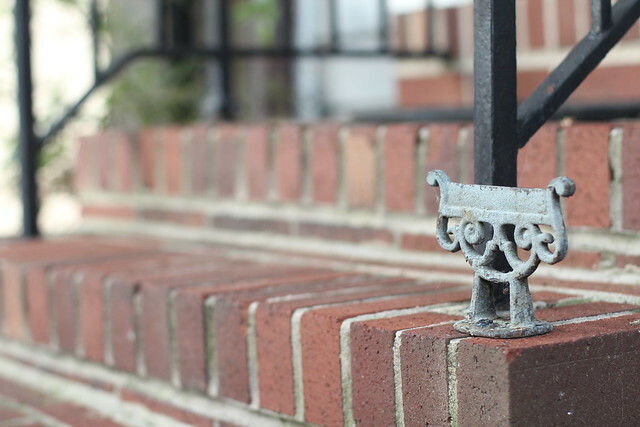 But now that we've progressed beyond the days of mud covered sidewalks and trash filled gutters, these little mementos of a bygone era are a friendly reminder of the past. There's no doubt the series of boot scrapers found on the sidewalks and front steps of Old Town can't all be original. 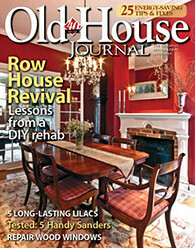 Though I'm sure some are the real deal and have stood the test of time for 150 years or more, it's also rather likely that some homeowners have attempted to reclaim a bit of lost character, or possibly impose some of their own, by finding a salvaged antique boot scraper and installing it on their home's stoop. These can often be identified due to their location of installation or method they were attached. For example, most scrapers would have been located at the sidewalk level next to any entry stairs. Those installed at the top of entry stairs probably have been moved or added later. I mean, how many people would have wanted mud and horse poop tracked up their stairs on the way into the house? 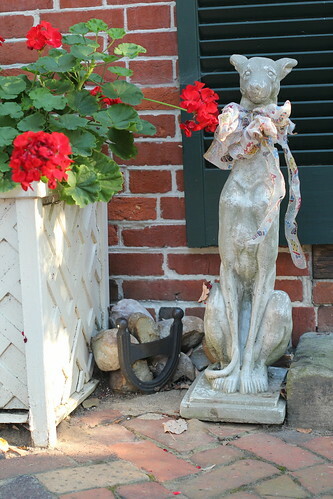 ...Or the very appropriate for Alexandria, a depiction of "Alex," the Old Town Scotty dog mascot. But my personal favorite animal scraper is by far the wiener dog boot scraper. Sure, it may not be all that historically accurate, and perhaps not necessarily antique, but who can beat a welcoming wiener dog to help you remove the mud from your boots? I think the obvious answer is, "nobody!" Of all of the various scrapers we've seen around town, there are actually two that we've found that truly stand out among the rest. 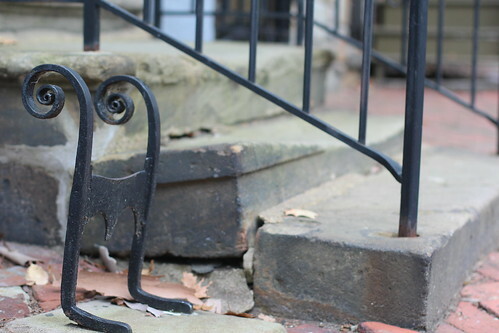 This isn't due to their ornate design, or their undeniably cute animal representation, but rather their intentional integration into the home's architecture. 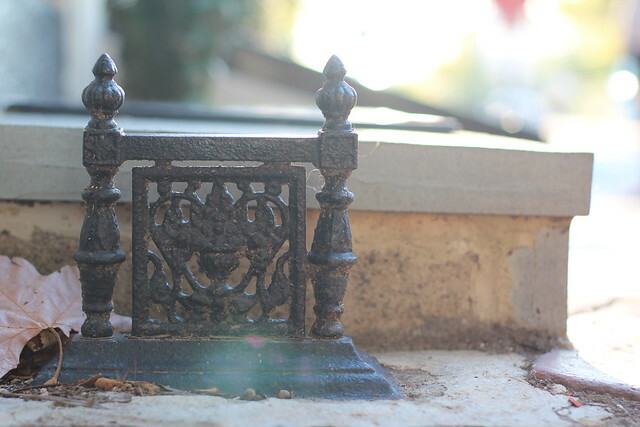 Lets see if you can pick out the boot scraper on this home. Do you see it there? Second step, between the spindles? 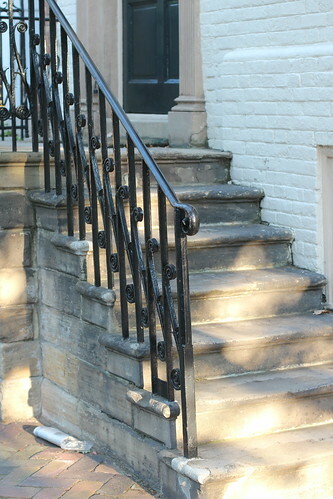 While most boot scrapers are a secondary thought, placed beyond the perimeter of the home, these two boot scrapers have been worked into the very elements that give each home its identity, their iron stair railings. Here's a closer look. In this case, the only thing necessary to turn the home's wrought iron railing into a completely integrated boot scraper is a single piece of steel installed between two spindles. The second house that we've found with a similar configuration goes slightly beyond the quick implementation and instead required a bit more thought and intent. This is what I consider "going the extra mile." The alteration of the spindles to accommodate the scraper, the classic design, this is almost undoubtedly an original element of this early 19th century home, and I'm so happy it's had the opportunity to stand the test of time. 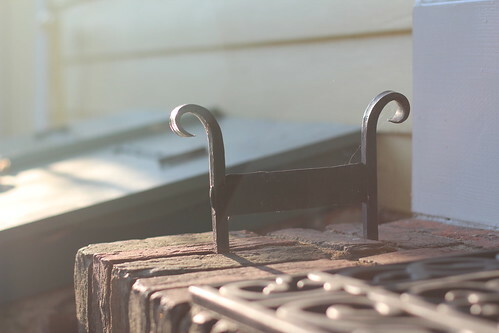 A feature like this could so easily have been lost over the years, but this home has avoided the wrath of remodeling that may have otherwise eliminated this truly character building element of the home's exterior. 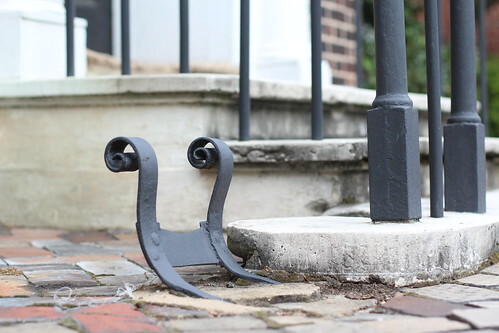 As you can see from our photos, which have incidentally only scratched the surface of the plethora of boot scraper styles, sizes, and locations around Old Town, the boot scraper is alive and well in this little town of ours. And really, who can blame the boot scraper fans for proudly displaying their implement, even if it's not necessarily meant for its originally intended utilitarian purpose, but rather for the nostalgic show of it? Do you have any boot scrapers that you know of on houses around you? Are you a lucky antique boot scraper owner? If so, is it original to your home, or was it added for that little bit of extra flair? 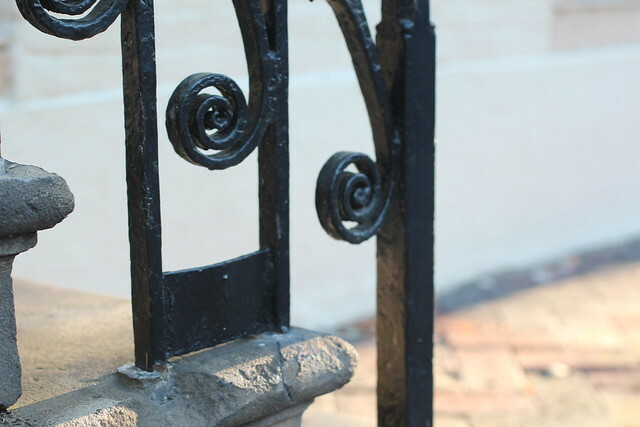 Or maybe there's a subtle architectural element that you look for or appears in your town? If so, we'd love to hear about it. Thanks for the bit of history Alex. My parents had a boot scraper in the garden at the base of their back porch. 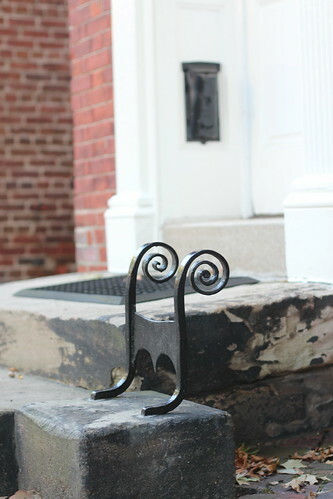 Nothing fancy, just a functional piece of wrought iron. I believe my dad brought it to the house from his dad's farm after my grandfather passed away. When we sold my parents' house this year, I made sure to dig up the boot scraper which was anchored in a chunk of concrete. My brother now uses it as a piece of garden art at his home. Great story. I feel like most of the ones around Old Town tend to be "fancy," even when simple. 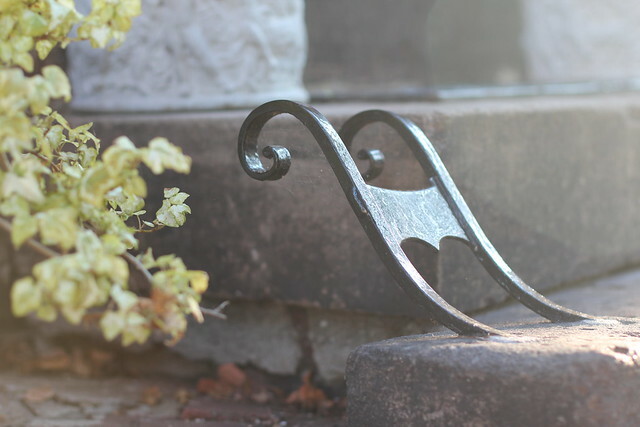 I've since seen a few that are simple pieces of bent wrought iron. I think the end result of any is pretty much the same. It's great that you dad's is still in the family. I absolutely have a few good restaurants you can enjoy. Check our giant list here: www.oldtownhome.com/2013/8/23/Restaurant-Week-in-Old-Town-Alexandria-Means-Endless-Options/ and pay special attention to the starred ones on the list. Those are all our top choices. My Grandparents farmhouse has a boot scraper. Just a piece of iron anchored into the front step. Not quite as old as these, although probably at least 100 years old since the farm has been in the family for well over 100 years. That's great that your farm has been in the family that long. I'm very jealous about places like that. I love old properties, but appreciate the properties with consistent family histories even more. I know how prevalent they are in Brugges, and I think that's even where boot scrapers sort of came into fashion. But like you said, there they are mostly mounted to that hole in the front of the house. I'm willing to bet you can get a new piece of iron to make it functional again. Might be a fun project. 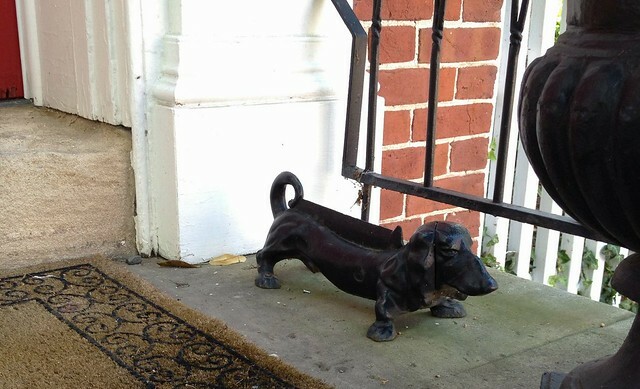 We have a wiener dog boot scraper (in Florida)! It's cast iron and I've had it about 20 years. I used to ride horses and boot scrapers are still very prevalent in the horse-riding community. I'd guess they are still commonly used on many farms also. Great post! 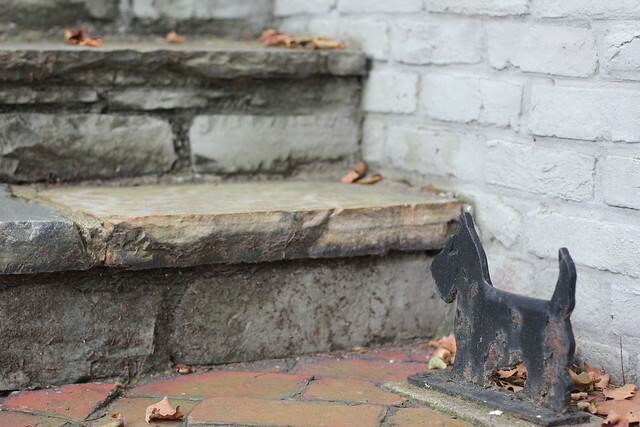 Aww, a wiener dog boot scraper? That's so cute! You should totally find an old one and retrofit it in your walk. They still do serve a useful purpose, even. I don't have one at my house (yet), but JC's house has the one from my grandparent's farmhouse. He keeps it by the back stairs. Since he's a towtruck operator, he often comes in with muddy boots. The above is very interesting about boot scrapers, I have two myself and are very rare the only other one I no of are situated at the main entrance of highclere castle birkshire former home of lord and lady cearnarvon also the downton abby programme, if yourself or anybody else would like to see them please send me an email and I will get back to you, kind regards joh. I recently purchased the dachshund boot scraper at a garage sale for $10. I realized it was fairly old because of the patina but thought I was buying a doorstop. 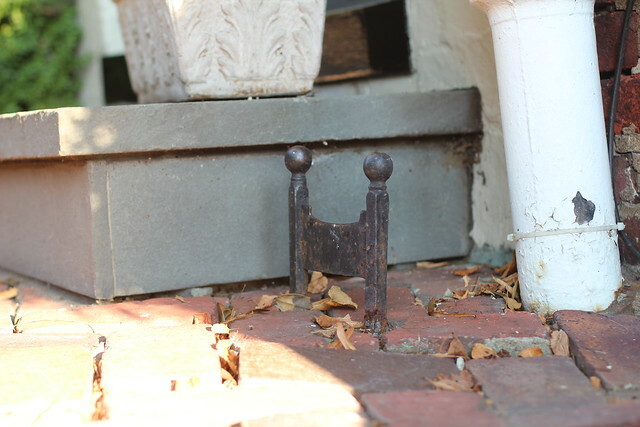 Once home, I researched this piece and realized it was a boot scraper. It is approximately 21" and very, very heavy. I thought it was charming and now have it sitting at my back door. You lucky people! I used to see these all the time, and now cannot find one at all. Everything is brushes. All I want is the blade and some kind of base so I can set it up. I live in the southern fringe of the Big Thicket of Texas. When it is damp outside, I cannot get in the house without bringing a pound or two of dead leaves with me on my shoe soles. This is just a paint scraper turned upside down...why does not someone still offer them? They'd sell like hotcakes HERE.